After using trabasack for his film about problems with pavements and powerchairs, blogger Steven Sumpter was kind enough to do a full review of Trabasack Curve, using it as a general powerchair tray, a netbook bag and as a bed tray. The review can be seen on Steven's blog here Trabasack Product Review, but I have also copied it below. "If you watched my film “A short film about pavements” then you will have seen the tray that was on my lap during filming. 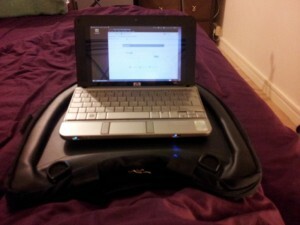 That tray is called a Trabasack, and it is actually a lap-desk and a bag in one. I have been using an Original Trabasack Curve for a couple of weeks. It consists of a leather feel tray, with a cushioned rim running around it. On the other side there is a bean bag which allows it to sit comfortably on your lap. A zip allows access to the section between the two so that it can be used as a bag. Trabasack Curve has two easy to use ring pull zips. The Trabasack can be found on their website, www.trabasack.co.uk at a cost of £39.95. " We are very grateful to Steven for his honest and thoughtful review. Other reviews of trabasack can be found here.